I have authored four books and a number of articles in magazines, journals and law reviews. 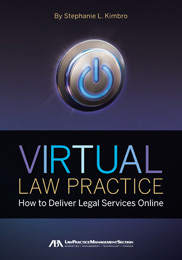 Virtual Law Practice: How to Deliver Legal Services Online is a practical, how-to manual for attorneys who want to deliver legal services online by creating a virtual law office that is either completely web-based or integrating a virtual law office into a traditional practice. The book will take anyone interested in the concept of virtual law practice through the different management structures, technology options, ethics and malpractice issues, marketing methods, daily management, and serve as a “how-to” guide for practical implementation. The book features case studies from attorneys engaged in virtual law practice and elawyering as well as advice from practice management advisors, IT & security professionals, and marketing and business professionals among others. Contributors include Sharon Nelson, Carolyn Elefant, Nicole Black, Richard Granat, Marc Lauritsen, Jordan Furlong, Erik Mazzone, Susan Cartier-Liebel, Larry Port and others. The book includes a glossary of terms related to virtual law practice and an appendix of state-by-state ethics rules and opinions and other resources related to virtual law practice. Because the technology involved in creating and maintaining a virtual law office changes frequently, I intend to update the information in the book on my blog as necessary. The second edition of the book was published in the Spring of 2015. Online Legal Services for the Client-Centric Law Firm published by Managing Partner, Ark Group, August 2013. 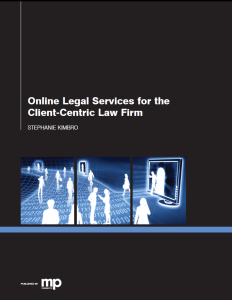 The report is for lawyers who are interested in learning about and possibly adding online legal services to their law firms. Here is the Executive Summary and Chapter One. From the publisher: “With increased competition from non-lawyer legal services companies, the demand for more competitive and diverse pricing models, and reductions in client’s legal budgets, the most innovative law firms have begun to recognise the need for online legal services. These firms are realising that online delivery is not solely a way to increase revenue for their practice, but it is also a method of serving the public that meets a clear need for more cost effective delivery of legal assistance. 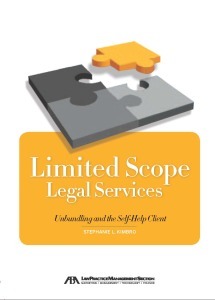 Limited Scope Legal Services: Unbundling and the Self-Help Client published by ABA/LPM, March 2012. Richard Susskind’s End of Lawyers:Rethinking the Nature of Legal Services introduced lawyers to changes in the legal marketplace and made them aware that they would need to adapt to these changes or be left behind. My new book examines the practice of unbundling legal services as one method of adapting to these changes in the legal profession. The book is intended to provide an overview of how unbundling is changing the marketplace – both within and outside of the legal profession. Limited Scope Legal Services provides practical guidance for unbundling in different practice areas and within different law firm structures. Ethical concerns, best practices and successful marketing both online and off are covered and case studies, sample agreements, and checklists are included to provide additional guidance. 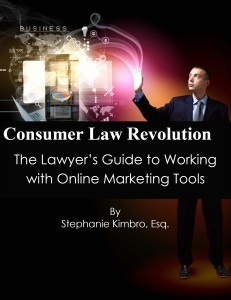 The Consumer Law Revolution: The Lawyer’s Guide to the Online Legal Marketplace, (2013). I have written an ebook as a precursor to the full book. 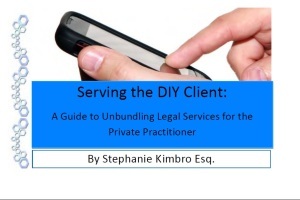 This will serve as a practical how-to manual with best practices for lawyers wishing to collaborate with branded networks to market their practice, deliver legal services to clients online, and for lawyer brand building and client development. Click on the image to download the free ebook. There is a revolution occurring in the delivery of legal services in the United States. Consumers in need of personal and business legal services are turning to the Internet to seek legal assistance. This should not come as a surprise. The public is going online for almost every other consumer need in their personal and professional lives. Instead of marketing legal services to the public, lawyers need to understand how to create a better marketplace for legal services. Companies focused on the legal industry have identified this enormous unmet market need and are making strides to brand their reputations online as affordable and accessible solutions. These companies are developing technology platforms to deliver services directly to the public. They are also inviting lawyers to team up with them to deliver legal services online. Speeding up consumer law revolution, the number of legal technology startups has grown rapidly. They are obtaining funding from major venture capitalists, gaining support of academic institutions and startup incubators, and entering into relationships with companies outside of the legal profession that have more experience in ecommerce. These startups are also testing the waters of lawyer regulation and ethics to find models of monetization that will sustain their growth. More importantly, these companies are actively building their lawyer networks. They need licensed lawyers who recognize the change in the legal marketplace to join with them to serve the consumers seeking online legal services. The legal profession must learn to collaborate with nonlawyer legal service companies in order to meet the public’s need for affordable and accessible online legal services. Rather than attempt to compete with the online “branded networks” with million-dollar marketing budgets, innovative lawyers will understand how the consumer law revolution impacts the legal marketplace, their private practices, and their clients, and will learn to collaborate with these companies and their branded networks. As a form of lawyer advertising and client development, the use of online marketing tools has great potential to increase access to justice in our country for certain legal needs, as well as become a resource for additional client development and revenue for many lawyers. The purpose of this ebook is to introduce the different and evolving models of branded legal services networks and to review the different forms of online marketing tools they provide. Included in the full book is a background on online lawyer advertising with a discussion about the underlying assumptions behind our existing restrictions on methods of advertising legal services. The full book also goes into the many ethical issues that may arise from the use of online marketing tools without the lawyer’s attention to best practices.